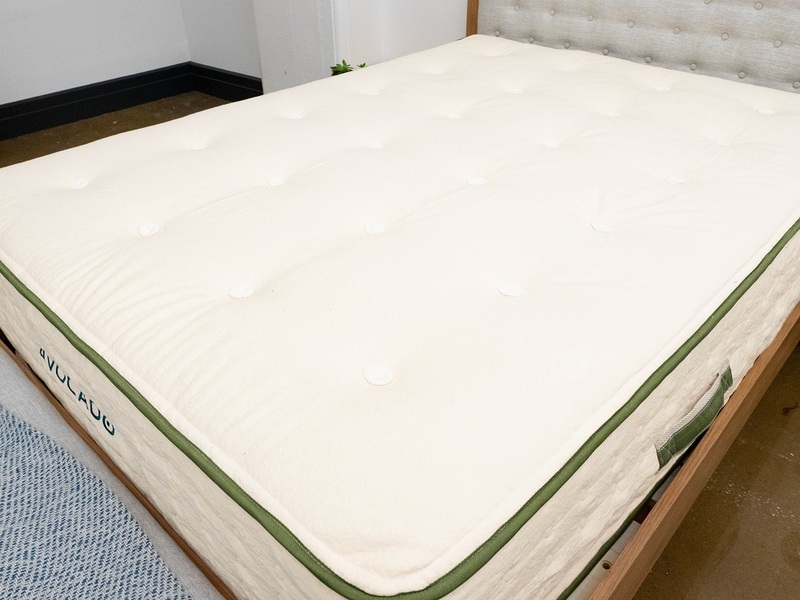 Avocado Green Mattress Review - A Nontoxic, Natural Mattress for You? 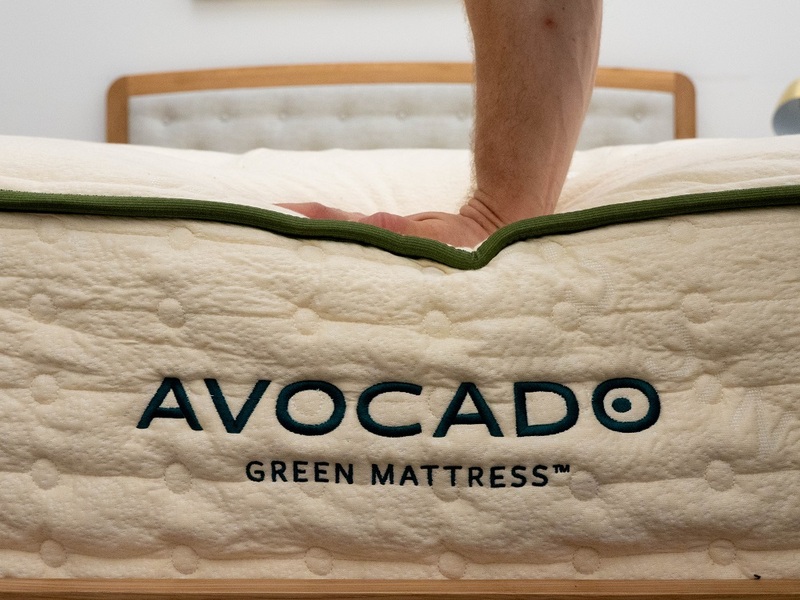 Founded in 2015 as an eco-conscious answer to the bed-in-a-box boom, Avocado has since grown into one of the premier green companies in the sleep space. Combining 100% Dunlop latex with 100% GOTS Organic certified wool & cotton and recycled steel coils, the brand’s flagship hybrid mattress aims to be as comfortable as it is easy on the environment. 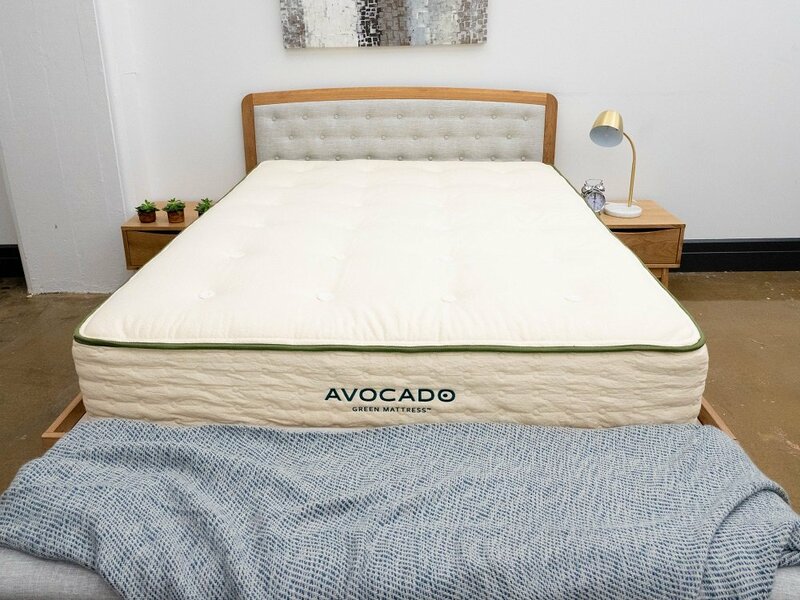 Continue reading below for my full review of the Avocado mattress. Don’t have time to read it all? Click here to skip to the bottom and check out my review summary. Composed of 100% natural latex and pocketed coils, the Avocado is as eco-conscious as it is comfortable. Save $100 off your purchase with our exclusive discount! 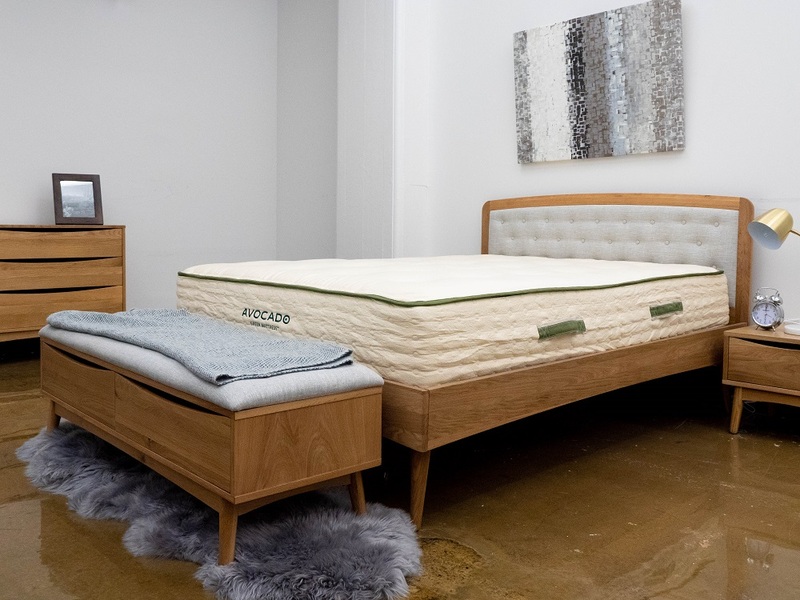 Avocado’s Standard Green Mattress features a simple two-layer design of latex and pocketed coils, measuring up to an 11” profile. The combination of materials is intended to create a sleeping experience that’s as pressure-relieving as it is supportive all while providing the sleeper with plenty of bounce. Now let’s jump on into this bed to further investigate its hybrid construction! Cover – Built with organic cotton and quilted with organic wool, the cover of the Green Mattress is super soft and gentle, providing the sleeper with immediate comfort. Since I’ll be throwing around the terms “all-natural” and “organic” a lot in this review, I thought I’d give you all a quick break down of some of the pros and cons associated with beds made up of natural materials. Pros: One of the biggest pros of an organic bed is that you’ll usually know exactly from where all its various materials have been sourced. 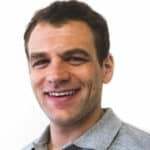 This can provide a lot of clarity and reassurance to the consumer, especially if it’s important for you to know the practice behind the process. The overall production also generally results in a smaller carbon footprint, which can be a big selling point for eco-friendly sleepers. Cons: Given all these great benefits, one of the most significant detractors is cost. Locally sourcing materials and ensuring the best in organic product can be expensive, so “green beds” often come with a hefty price-tag. Thankfully, the Avocado is pretty reasonably priced with a Queen size coming in at $1,399. After taking a look at the construction of the Avocado, let’s chat about the firmness and feel. I started off by applying light hand pressure to the mattress and found that I was immediately interacting with the gentle wool and cotton blended into the cover. As I pushed in further, I encountered the bounce of both the latex foam and the pocketed coil system. Since folks of different sizes and weights are going to feel firmness differently, I decided to bring in three other testers to help me figure out how firm the Avocado is. To do this, we each took a turn lying on the mattress, gave it a personal firmness rating and then compiled them on the graph below. 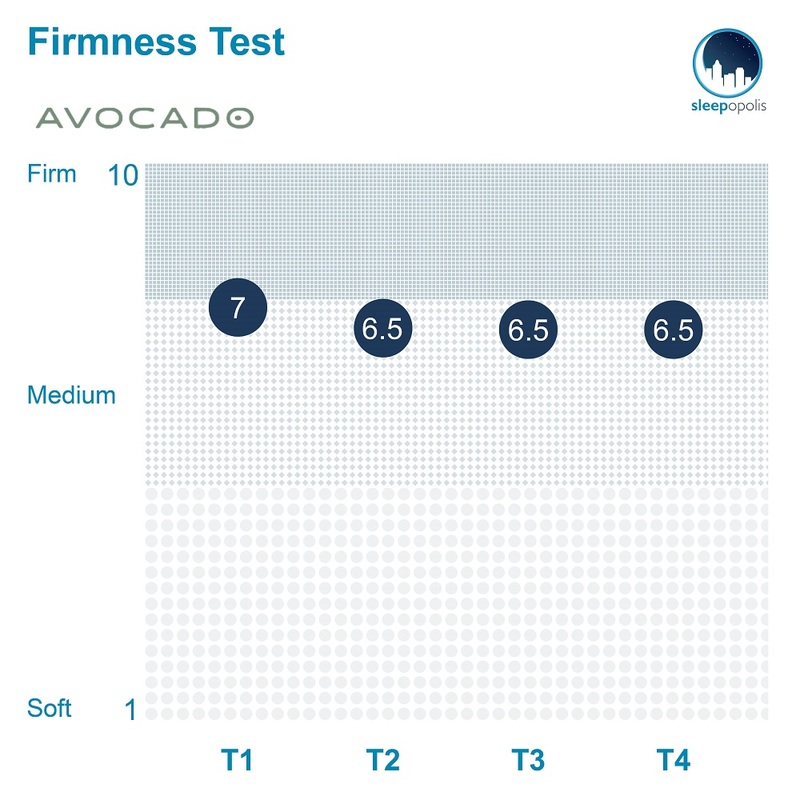 My testers were pretty much in agreement about the firmness of the Avocado, giving it an average rating of 6.6, which syncs up nicely with the industry standard of 6.5 for medium firmness. I personally gave the bed a 7 as I found it to be just a touch firmer than medium firm. 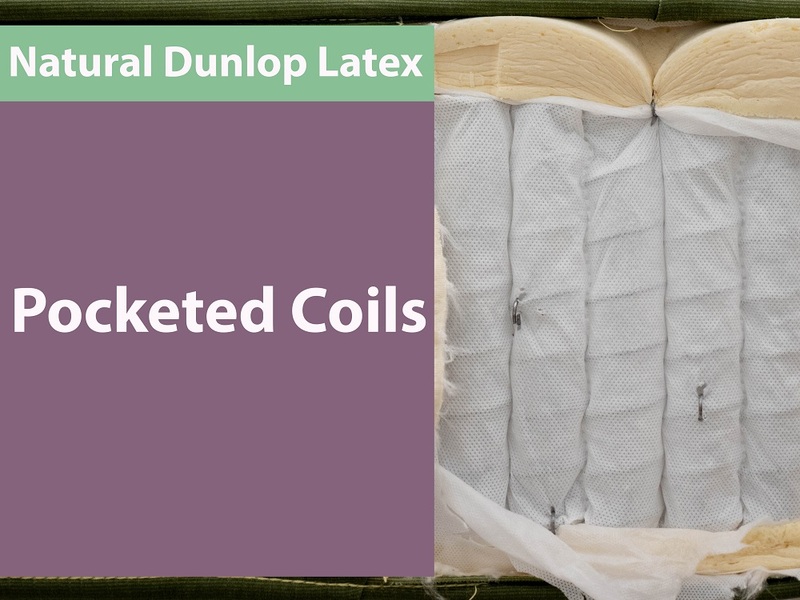 While you’ll likely experience some nice comfort from the quilted cover and top latex layer, the tall section of pocketed coils creates a ton of firm support that’ll keep you lifted on top of the bed. 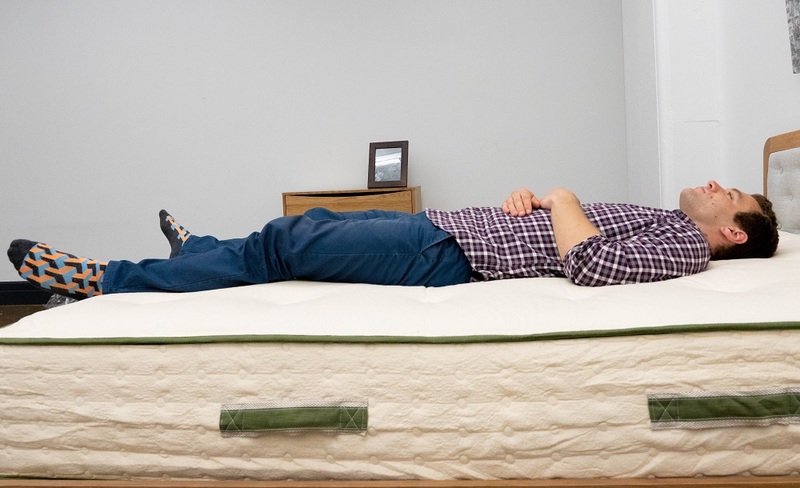 Though this could be great for those of you who doze primarily on your backs or stomachs, it may not be the best fit for side sleepers, to whom I’d recommend checking out the softer pillow-top version of this mattress. I should also note that your weight will likely determine how you’ll feel the bed, with heavier sleepers sinking through to the coils faster than lighter sleepers, thereby experiencing it as an overall firmer structure. To help you visualize where these tension spots might crop up on the Avocado, I placed a pressure map on top of the mattress and lied on my back, side and stomach. You can see the results on the image below where pressure is represented from blue (low pressure) to red (high pressure). Back – Lying on my back, I felt as though my weight was pretty evenly distributed across the surface. Though I definitely experienced the Avocado as a firm bed, I thought its quilted cover and latex comfort layer did a good job of filling in the space at my lower back for some nice relief. The bounce also made it very easy to move around and change positions. Edge Support – Scooting closer to the edge of the bed, I felt a lot of great support! The coils help to maximize the usable space of the mattress, allowing you to sleep all the way to the side. 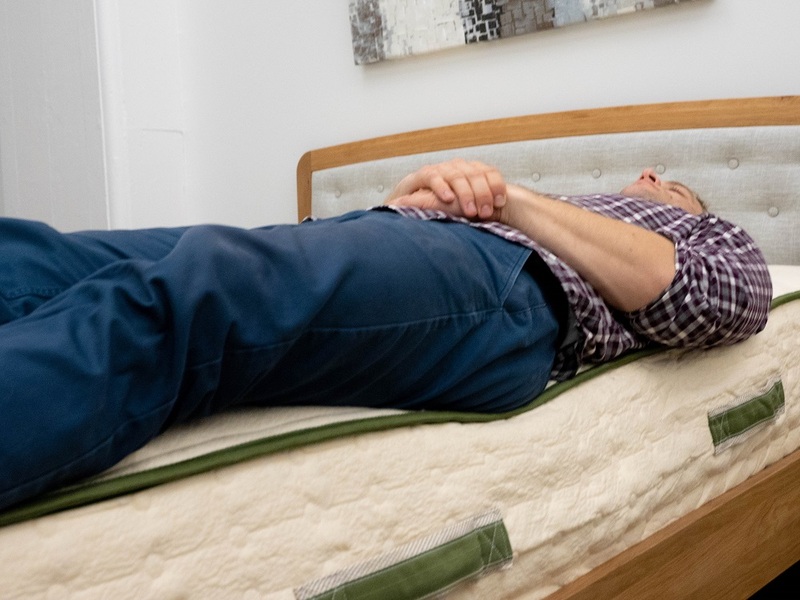 Side – As you can clearly see in the graphic above, once I turned onto my side, I experienced the formation of pressure points at my shoulders and hips, typical problem areas for side sleepers. Considering how firm the bed is, I’m not super surprised by this as strict side sleepers tend to prefer softer beds that bring more cushiony relief to these sensitive spots. Stomach – And finally, my stomach. I felt a lot of great relief in this position, thanks to the bed’s buoyant lift, which kept my spine in a nice alignment. Unlike side sleepers, stomach sleepers tend to dig firmer beds that keep the shoulders in a nice, even line with the hips. Like Sleeping on Your Side? Check out my top picks for you! Next up, let’s chat motion transfer, or the amount of disturbance you’re likely to experience from one side of the bed to the other. This test will be especially important for those of you planning to share your bed with a partner, as it’ll let you know just how bothered you’ll be by their movements in the middle of the night. These are really high motion transfer results, which tells me you’re likely to feel your partner moving around at night. While these may not be the most ideal readings, they’re at least consistent with the bed’s hybrid design, which combines bouncy latex with even bouncier coils for—you guessed it!—a whole lot of bouncy disturbance. When buying a new bed, most people want to know whether they’re going to be sinking “into” the mattress or lying “on top” of it, so our last test is going to be all about sinkage! 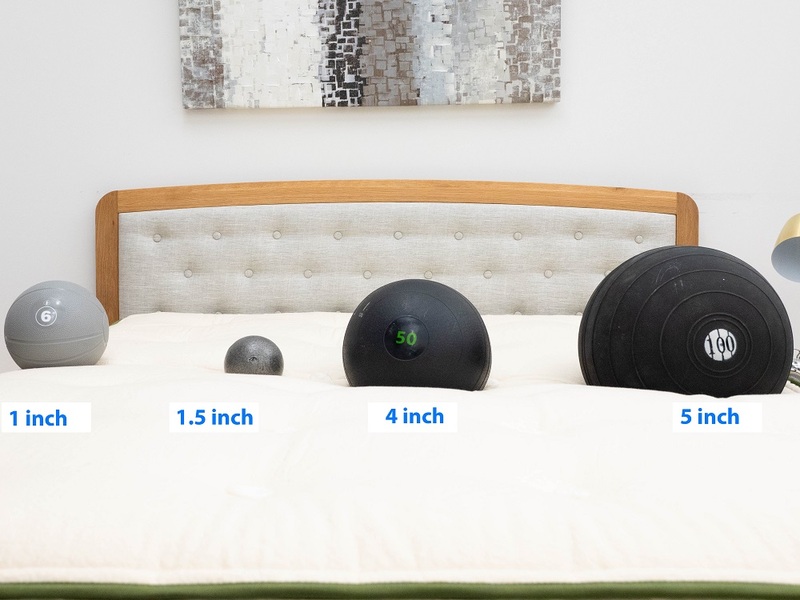 To visualize this variable, I placed four balls of varying sizes and densities (a 6 lb medicine ball, a 10 lb steel ball, a 50 lb medicine ball, and a 100 lb medicine ball) on the mattress and measured how much they compressed the surface. If you assumed that the Avocado wouldn’t have a lot of sinkage because of its tremendous bounce… you were right on the money! As you can see, while you’ll be able to sink into the quilted cover and latex comfort layer a bit, by the time you get to the supportive coils, you’re likely to be squarely positioned on top of the bed. If you’re convinced the Standard Green is the right mattress for you, the size and pricing information for the mattress are below. Please note that these prices reflect standard pricing, but you can use the code SLEEPOPOLIS100 to save $100 on your mattress purchase! 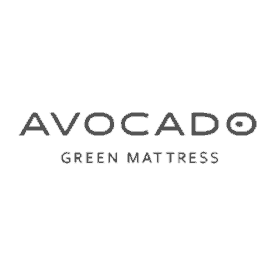 IS THE AVOCADO MATTRESS RIGHT FOR YOU? One of my favorite things about the Avocado is that its entirely built with all-natural materials. From the organic cotton in the cover to the recycled steel coils in the support section, this bed is a fantastic green option. These materials also create an incredibly durable structure that’s sure to last for years to come. And of course, this mattress would also be a great pick for anyone who wants some serious bounce as the combination of latex and pocketed coils makes for a very springy bed. 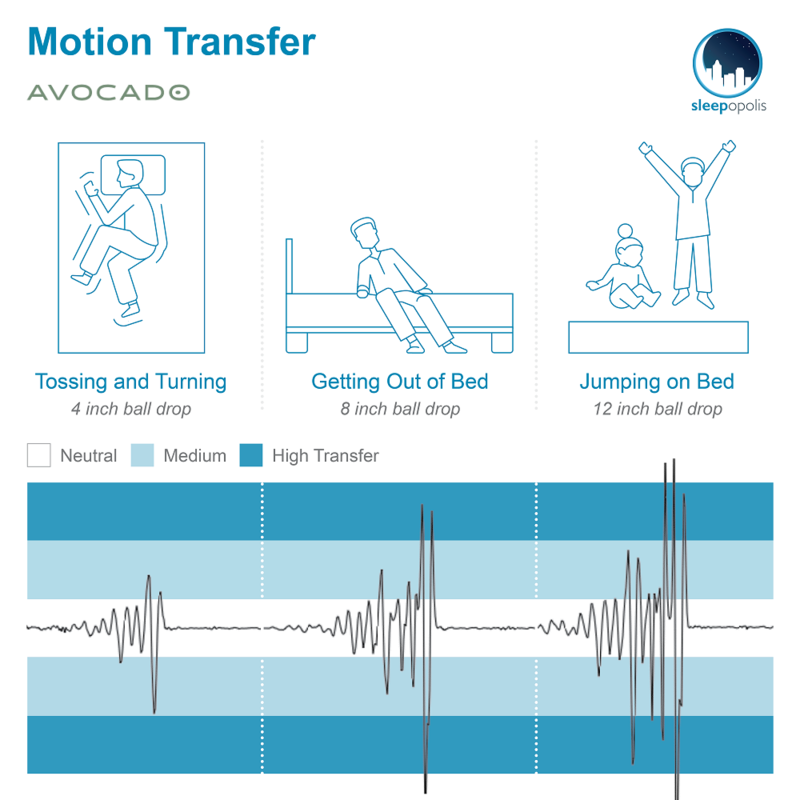 As I mentioned up top, the Avocado doesn’t have the best motion transfer results, which could be a dealbreaker for those of you who get easily disturbed by tossing and turning in the night. This bed also doesn’t have a ton of sinkage, which may not work for those of you in need of some deep body contouring. For more information on the Avocado, visit its website here! Avocado is made from natural and organic materials including 100% natural dunlop latex and a pocketed coil system. Avocado’s cover is a noticeably breathable combination of organic cotton and organic wool from New Zealand. 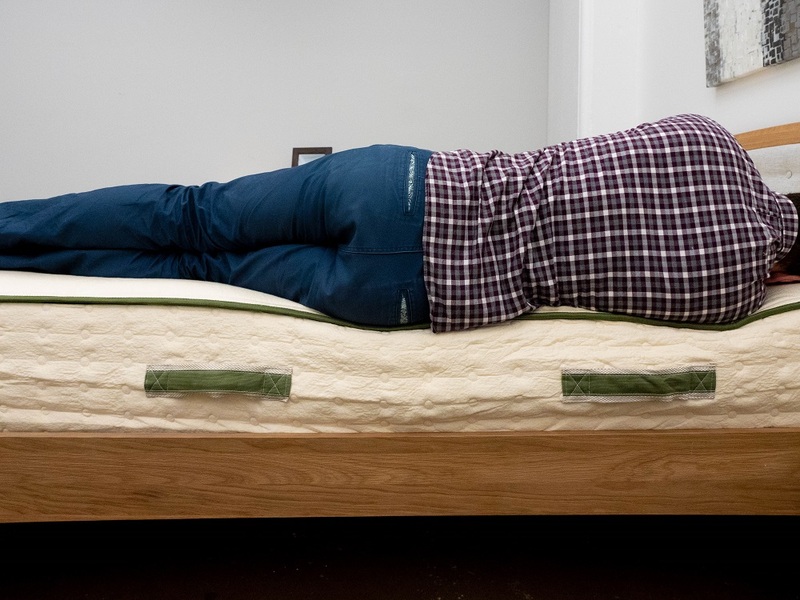 This is a bouncier mattress that trends to the firmer side for most sleepers.